Income Tax on Share Market Income, Types of taxes & Which capital gains are taxable? Our today’s center of the discussion is on “Income tax on share market earning.” As an investor, it is quite obvious to think do I need to pay tax on income earned from selling shares. Tax always comes in complementary with the income of any person. But these taxes are charged according to a person’s income. The income can be a fixed salaried income or it can be fluctuating if the person is indulged in any business occupation. But it’s not that tax is charged only on incomes which are earned through your job or your personal business. In fact, it is charged on your incomes which you earn through the share market. Share market these days has become the most demanded choice by a number of people to earn aggressively in a short span of time. On those earning you have to pay taxes also. So, if you hold share market basics knowledge it will be beneficial for you. What are the taxes that are charged on your incomes through stock market? How are the taxes charged? What are the benefits of taxes on stock market earnings? All this will be let to know you in this article as it is also a necessary part to understand because you are the citizen of India country and you pay taxes to the government, so you should know that where your hard-work money is going. So, without wasting much time, let us begin the class. Which Capital Gains are Taxable? See, there are three kinds of taxes which are charged on the earnings via the stock market. Following are the income tax on stock market earning. These all have been categorized according to the holding duration of the stocks at your disposal and they all have a significance of their own in the world of taxation. You know that when you buy shares from the market, you have to hold it for some time until you scan the profitable opportunity to sell them. So, if you hold your shares at your disposal for more than 365 days, or say, for more than a year, then that kind of stocks comes under the category of Long-Term Capital. No taxes are charged on these securities, but condition applies, that you should hold your stocks for at least 1 year. After that, you can sell them off anytime at some profit. For example- you have bought shares of Rs1 lakh and you keep them with you for more than 365 days. After 365 days, you sell them at the profit of Rs20, 000. In this case, you do not have to pay any taxes, since you have completed the required duration of 1 year for long-term capital gains. You just have to mention your income which you have earned on your Income Tax Return. For mentioning the returns, you have to fill an ITR Form 2. Best Investment Options in India How to Invest in Share Market? This is just a reverse of the previous Long-Term Capital Gain. Here, you have to pay the tax on your earned part. When you do not hold your already bought stock for more than a year or 365 days and you redeem it to make a profit quickly, in that case, you have to pay tax and that too at flat 15%. Flat means there will be no deduction from your income in the name of your expenses incurred or discount you could claim. It is just straightly deducted from your real profit income. You had purchased shares from the stock market valuing Rs1 lakh and before 1 year you sold them to earn a profit of Rs20, 000. In this case, you will have to pay taxes and that would be flat 15% on your profit. So, you will pay Rs3000 tax here. What are NIFTY and SENSEX? When you bought shares from Intraday trading or from Futures and options, and the income that you gained by working on these investments is actually the business income. You are liable to pay tax on your business income. They are called business income because business is a daily activity and daily you buy or sell commodities. Similarly, in the in intraday, the person buys the shares on a day and on the same day, he sells them off. In futures and options, you have to buy the shares in a lot but there is no boundation like the intraday to sell them the same day. You are provided a definite period to execute your selling activity within that period. No fixed rate of tax is charged on the incomes through intraday and futures & options. Rather, the tax is charged as per the tax slab of income. If your income is around 2-3 lakh per annum, then to tax will be charged. And for the above amount of income, there is a kind of percentage pattern which is followed to charge on various ranging incomes. The main benefit of this stock market kind is that you can add your expenses also in your earnings and the remaining amount will be liable to pay tax. Suppose you have purchased shares or lots from F & O and intraday respectively and you gain a profit of Rs20, 000. This 20,000 will be added to your existing income. You can even subtract your expenses also like for compensating your manpower, for buying laptops or infrastructures, etc. This Y amount will be charged to pay tax according to the tax slab in which it falls. Here, X is the existing income. The kinds of taxes are OK till here. But the question is how the government will determine what actual profits you have earned actually from the stock markets? Many times, people do not show their real income and profits in their file returns and thus they are able to pay less tax on less income. In 2004-2005 budgets, P Chidambaram announced a mechanism to execute the smooth inflow of taxes in the economy and remove the fraud cases. For this, he called the mechanism which is known as the STT. STT is an acronym for Securities Transactions Tax. As the name implies that this is a kind of tax which is levied on every stock transaction. Whether you buy or sell shares from or in the share market respectively, a rate of tax will be automatically charged on every buy/sell transaction. In this way, the activity for hiding the real profits and gains can be eliminated. Point to be noted that the tax will be levied only on those stocks which are listed in the stock exchanges. This would include equity, derivatives or equity-oriented mutual funds units. The rate to charge tax depends on the kind of security and the types of transactions, and the tax rate is determined by the central government. The tax is paid by the broker or the AMC, at the time of the transaction itself. Only the long-Term Capital Gains on stocks are not taxable, otherwise, the other two stock markets i.e. short-term and speculative and non-speculative gains are liable for tax payment. In short-term capital gains, you are liable to pay the tax at flat 15% rate. No matter in which tax slab you fall. You have to pay 15% tax without subtracting any kind of claims from it, in case you redeem your stocks within 365 days. In the case of debt mutual funds, both short-term and long-term capital gains are charged to pay taxes. When you earn through Short-Term Capital gains of debt mutual funds, your profit is added in your existing income and then tax is calculated as per the tax slab in which your total income falls in. When you earn through long-term capital gains of debt mutual funds, you have to pay 20% tax in case of indexation. Without indexation, you are liable to pay tax at the rate of 10%. If you have held shares for more than 1 year, it becomes your capital gains. There is no need to pay any tax on your gains also. But in the reverse case, you have to pay a flat 15% tax on short-term capital gains. In case there is a short-term or long-term loss during the financial year, it can be carried forward in the next year to compensate for the loss through the gains of the next year. This can be continued for 8 years. It means that you can compensate/set-off your losses in 8 years. But remember that, the losses on short-term can be set-off by the short term and the long term but the losses on long-term can be set-off by only through the long-term capital gains. Also, remember that long-term capital losses occur for shares where STT is paid cannot be carried forward for future set-off. The normal trader is one who buys shares, takes the delivery and sells them off in the market and this process takes some time. The holding of shares by them is short-term based. The intraday investor, on the other hand, carries the activities in a single day, that is, he buys the shares one day and sold them on the same day at some profit. The holding of shares by such investors is short-term as well as long-term based. For both the trader and the investor, the income tax of 15% is charged in case of short-term capital gains, under section 111A. The tax deduction on earning via intraday trading is the same as any other business activity. The speculative losses or in other words, the losses incurred due to single day transaction can be carried forward in the next year and this can be continued till 4 years, provided that you have mentioned your incomes or losses in your tax file returns. Derivative trading embraces Futures and Options trading on the various stock, commodity and currency exchanges in India. All derivatives trading activities done through the recognized exchange are not considered as speculative income like in intraday trading. Hence any profit or loss arising from derivative trading is treated as arising from business activity. In case of a trader who trades in derivatives and also buys shares and receives delivery, can claim short-term capital gain for money made in shares for which he receives delivery in his DP and claims income/loss from derivatives trading as business income/loss. So we have read about the different stock markets and the taxes meant to be levied on them. 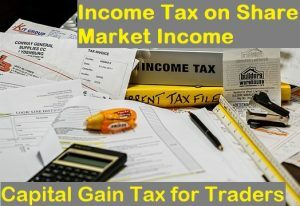 I hope you find the information about Income tax on share market trading useful. If you liked it, please do not forget to share it among others who are curious to learn about income tax on share market income. Hope this article has eased all your confusions about the capital gains taxes and the rate of taxes. Still, if you have any confusion left in your mind, then you are most welcome at our portal to clear your doubts. Just comment in the comment section below. Do not forget to like and subscribe to us if you gain something useful.